Many thanks for our sponsor, the City of Knoxville for sponsoring the event! After our February workday we'll all be sticking around to exchange seeds. Bring your own seeds to give away and pick out some new ones. If you've always been aching to get a hold of that certain neighbor's heirloom cucumbers, this may be the event for you. Join us as we kick off our first monthly workday of the year. There will be plenty to do as we look forward to prepping the farm for Spring. Shake off some of those icicles under armpits and shed your winter blues. DON'T wear open toed shoes or clothes that you mind getting dirty. DO join us after the workday for our Seed Swap! ALL SALES ARE FINAL and support Beardsley Community Farm’s cause to alleviate hunger in Knoxville. Street parking is available along West Depot Avenue and surrounding streets. The closest public parking lot is under the I-40 overpass at the corner of E. Magnolia Avenue and Williams Street. The lot is a 3-5-minute walk from the venue. Check out this Downtown Parking Map for more options. Sponsors: The Mill and Mine, the WUOT, WUTK, WDVX, Flour Head Bakery, AC Entertainment. Musicians: hudson k, Knox County Jug Stompers, Badd Hatt'rs, Spooky Ooos, and Obayana Ajanaku. Vegan or Vegetarian Soup with Flour Head Bakery Bread: Cruze Farm Pizza Barn, Clinch River Brewing, OliBea, The Plaid Apron, Sunspot,Rebel Kitchen,Elkmont,Jig and Reel, The Pharmacy, Tupelo Honey and more! Silent Auction: Come bid on amazing silent auction items! This year we have over 100 goods donated from over 90 local businesses. The silent auction will run from 7 PM until 11 PM sharp. Join us for a unique dinner at The Plaid Apron on Monday, November 5th, 2018 from 6-9 pm. Our 8th Annual Raise the Roots dinner will feature the rich bounties of summer and fall on the farm. Dinner will be prepared by the owner and chef of The Plaid Apron, Drew McDonald, and his team. Doors open at 6 pm, and dinner will be served promptly at 6:30 PM. Guests will have an opportunity to learn about Beardsley Farm, meet farm volunteers, and share their experiences gardening and cooking in Knoxville and East Tennessee. All proceeds from the dinner will directly benefit Beardsley Farm. Pricing: Tickets are $60 per person or $200 for a table of four, or $80 per person for an added donation to the farm. Tickets are available here. About the dinner: The supper will be vegetarian, and vegan options will be available upon advance request. The supper will be locally sourced and most of the produce is grown at CAC Beardsley Community Farm. About beverages: Iced tea and coffee are included in your ticket. Guests are welcome to bring their own wine. Corkage fee is $10 per bottle. Beer and wine will also be available for purchase at the Plaid Apron. It’s the season of giving, so help us get the farm all tucked in for a long winter’s nap! Come for a little while or stay the entire time. We will be getting lots of projects done, including watering, weeding, harvesting, and preparing the farm for winter. It is because of the work of volunteers like you that Beardsley Farm is able to alleviate hunger in Knoxville - we would love to see you there! Please wear closed-toe shoes, dress for the weather, and bring a water bottle. There is no need to RSVP, unless you are volunteering with a large group. If you've never been to Knoxville's only urban demonstration farm, now is your chance! Bring the whole family to this exciting seasonal event. In case of inclement weather, this event will be canceled. Please check our Facebook event for updates. Call 865-546-8446 or email beardsleyfarm@gmail.com with questions. IMAGE DESCRIPTION: A collection of dried corn cobs with kernels in various shades of reds, browns, golds, and oranges. Help us get the farm ready for fall! Come for a little while or stay the entire time. We will be getting lots of projects done, including watering, weeding, harvesting, and preparing for our annual Harvest Festival. It is because of the work of volunteers like you that Beardsley Farm is able to alleviate hunger in Knoxville - we would love to see you there! 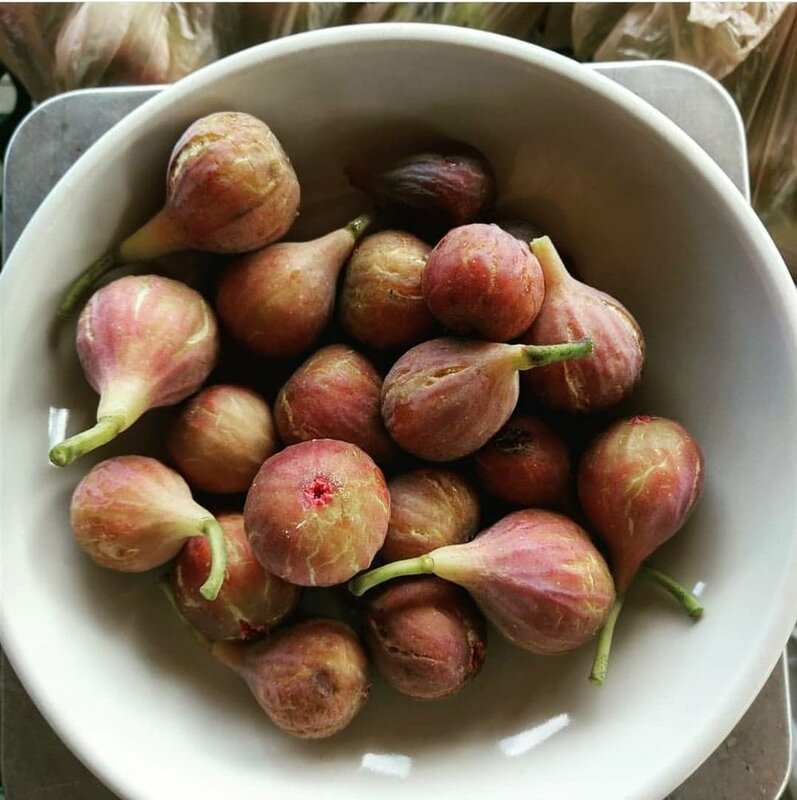 IMAGE DESCRIPTION: A white ceramic bowl filled with freshly-picked figs. The figs are mostly a brownish-red, fading to various shades of pink or yellow-green on some. Many have green stems on them. Come support your local non-profit urban farm! Come for a little while or stay the entire time. We are going to be getting a lot of projects done, including watering, weeding, harvesting, and invasive removal. We would love to see everyone there! Come out to CAC Beardsley Community Farm to support your local non-profit, urban, farm! Come for a little while or stay the entire time. We are going to be getting a lot of projects done, including watering, weeding, harvesting, and invasive removal! We would love to have our amazing community members there! Come an hour early (8am) and do some yoga (taught by our friends at Glowing Body Yoga & Healing Arts) with us before we start gardening at 9am! Come out to CAC Beardsley Community Farm to support your local non-profit, urban, farm! Come for a little while or stay the entire time. 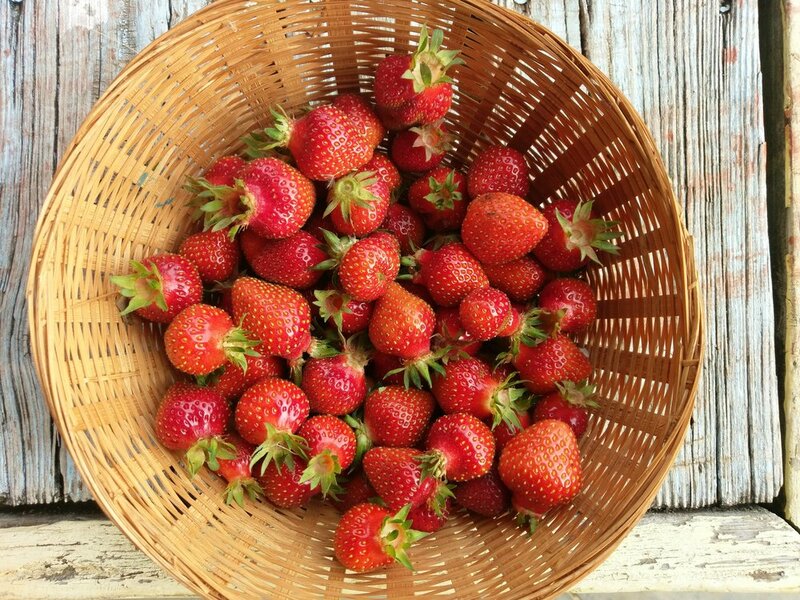 We are going to be getting a lot of projects done, including watering, planting, weeding, and harvesting delicious June produce! We would love to have our amazing community members there! Come an hour early (8am) and do some yoga (taught by our friends at Glowing Body Yoga & Healing Arts) with us before we start gardening! Join us for an hour of yoga at Beardsley Community Farm. Our farm yoga class is a Karma class and there is a suggested donation of $5. Feel free to come to yoga only, or stay afterwards to lend a hand in the gardens! Come out to CAC Beardsley Community Farm to support your local non-profit, urban, farm! Come for a little while or stay the entire time. We are going to be getting a lot of projects done this Saturday in preparation for summer and would love to have our amazing community members there! There is no need to RSVP, but helpful if you are volunteering with a large group. Support Beardsley Community Farm on May 6th by buying a plant or purchasing a pint. From 2 to 6 PM a dollar per pint will be donated to Beardsley to promote food security and sustainable urban agriculture in Knoxville. Representatives from the farm will be at the brewery to chat about volunteer opportunities, so come out if you'd like to learn more about this worthy organization. Solstice Supper at the Mill and Mine, celebrating Beardsley's 20th birthday! 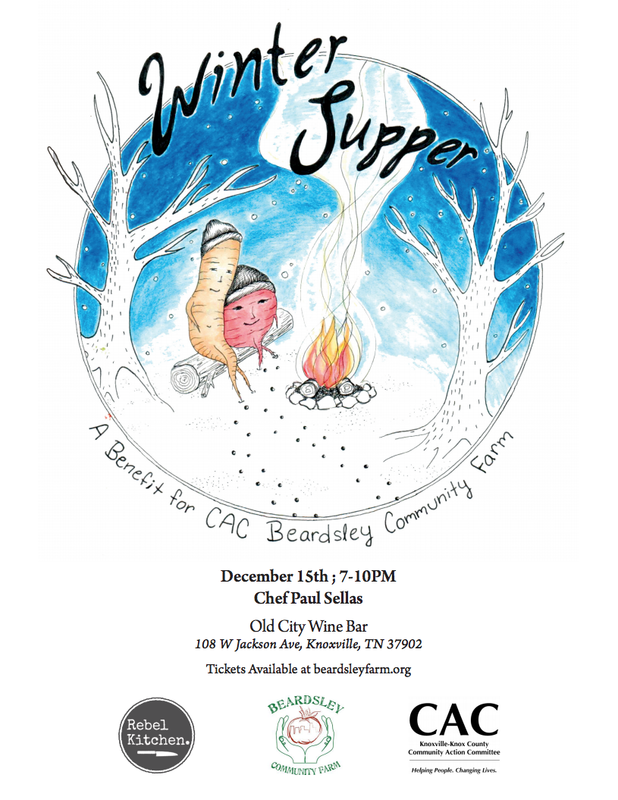 Join us for a celebration of CAC Beardsley Community Farms 20th anniversary at our annual farm to table benefit, Solstice Supper. The festive dinner will be at the Mill and Mine on June 21st from 6:00-9:00 pm. Cocktail hour begins at 6 pm, and the dinner will be served at 6:45 pm. Solstice Supper will raise funds for the farm's operating budget to provide sustainable grown produce to those in need in Knoxville. The dinner features four courses and includes local craft beer and hand selected wine. Tickets are available here. Buy plants and support your local community farm at this year's EarthFest! 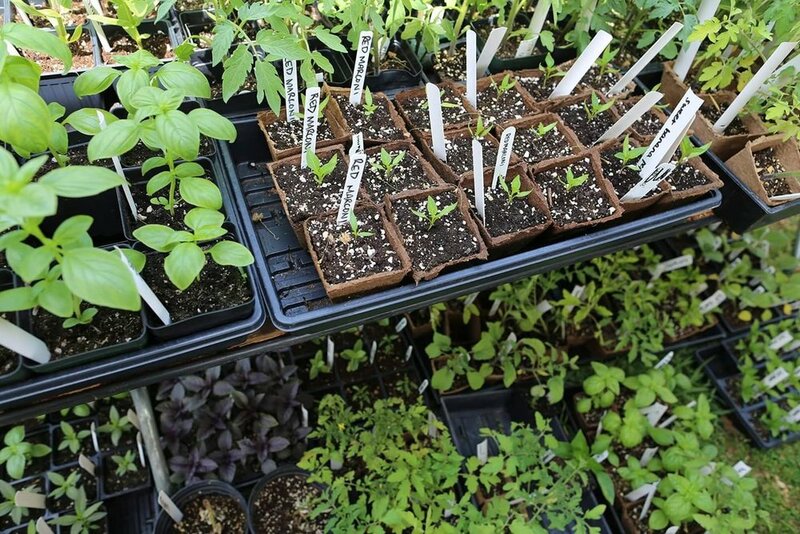 We'll have a wide variety of heirloom plants for sale. We will have sweet and hot peppers, 12 tomato varieties, eight herb varieties, and berries for sale. Check out this link to see all that we'll have. EarthFest will be held at the Knoxville Botanical Garden and Arboretum from 10am-5pm on Saturday April 28th. Find more information here. 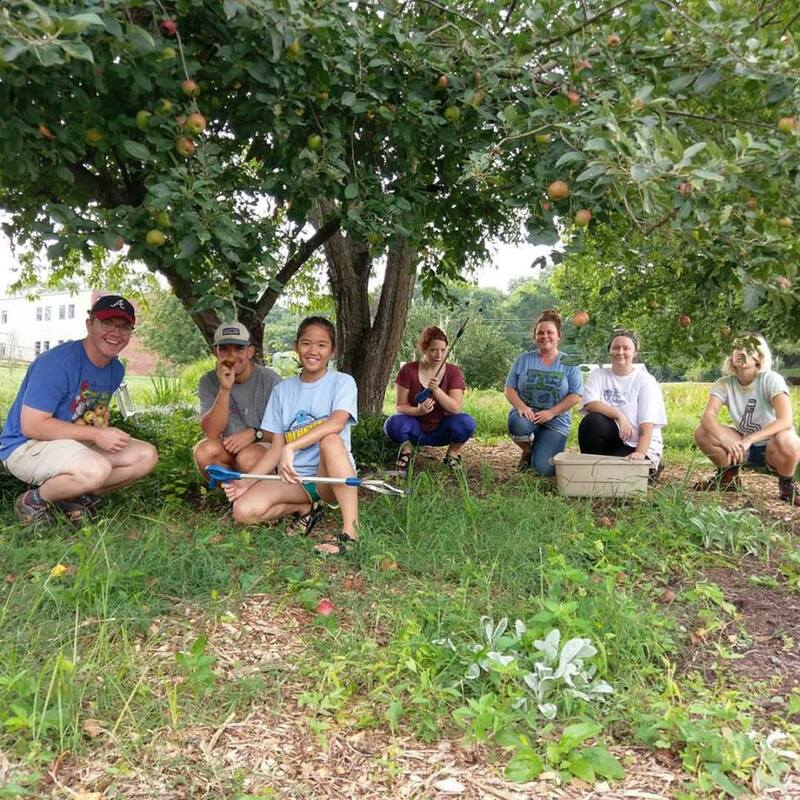 Come out to our end of April Summer Crops community workday at Beardsley Community Farm! Spend your morning helping us tackle the big projects we couldn't do without your help in preparation for summer crops!! We have tomatoes, peppers, and eggplants to transplant. We are so happy to be getting our hands dirty and hope you'll decide to join us. Be sure if you come out that you dress appropriately for the weather, wear close-toed shoes, and bring water. We'll start with a farm tour at 9:00 AM for those who are new to the farm, and then get to work. Plants for sale! We will have sweet and hot peppers, tomatoes, herbs, and berries for sale. Check out this link to see all that we'll have for sale. We can't spell community without U! See you at the farm! Come out to April's first community workday at Beardsley Community Farm! Spend your morning helping us tackle the big projects we couldn't do without your help in preparation for Spring! We are so happy to be getting our hands dirty and hope you'll decide to join us. Plants for sale! We will have sweet and hot peppers, tomatoes, herbs, and berries for sale. Plants for sale! We will have sweet and hot peppers, tomatoes, herbs, and berries for sale. Check out this link to see all that we'll have for sale. Get the latest information HERE. All skilled egg hunters ages 2 to 10 are invited to participate in CAC Beardsley Community Farm’s 2018 Community Egg Hunt on Saturday, March 31 from 1pm -3 pm! The rain date is April 7th. This year’s Community Egg Hunt includes over 2,000 eggs containing candy and toys hidden across three locations. Each location is specific to age groups either 2-4, 5-7 or 8-10. See the schedule of events below for when each group begins their hunt. BBQ sandwiches from BJ&S will be available for sale for $2 each. We willhave complimentary water and Powerade for attendees. Gates will open at 1:00 PM and close at 3:00 PM. The Egg Hunt Begins at 1:20 PM, and there are three different zones for three different age groups. Spring is right around the corner! Come celebrate by being outside in the dirt. Make sure to wear close toed shoes and dress appropriately..
Tickets are $100 (plus service fees). About the dinner: The supper will be include meat, with a vegetarian and vegan options. The dinner will be served promptly at 7:00 pm. About beverages: We will serve water, tea, coffee, and wine from Old City Wine Bar. Special requests: Please email beardsleyfarm@gmail.com if you have any dietary restrictions or needs, to request a vegan option, and for any special seating requests (i.e., you would like to be seated with friends who purchased separate tickets). Come celebrate the fall harvest at CAC Beardsley Community Farm with a free, family-friendly community event on Sunday, October 22nd! Harvest Festival will celebrate the farm, the community, and all things fall. Enjoy free food, children's activities, live music, and tours of the farm. Parking will be available in front of our Education Center, at the Wesley House, Mobile Meals, and the Ed Cothren Pool. Come dressed in your Halloween costumes! Free Food: Enjoy free chili with Flour Head Bakery Bread. The chili will be created by our friends at KARM, and the greens and ice cream will be prepared by UT Culinary School. Much of the produce in the chili, greens, and ice cream is soured directly from CAC Beardsley Community Farm. Children’s Activities: This event is perfect for kids! Children's activities will include paper hats, face painting, ring toss, nature crafts and more! There’s something fun for every child to enjoy. Don't forget that Halloween costumes are encouraged! Jack 0 Lantern Carving Contest: We'll be having a jack o' lantern carving competition. Carve your own pumpkin and bring the finished jack o' lantern to Harvest Festival. The Beardsley FArmcrew will be judging the winner based on originality and carving skills. Join us on Friday, October 13th from 6-8 pm for the Beardsley Farm Benefit Art Gala benefitting CAC Beardsley Community Farm and Alpa Rho Chi, a professional architecture and allied arts fraternity. The event will be held in Room 103 in the Art + Architecture Building on UT's campus. The Beardsley Farm Benefit Art Gala will showcase art pieces by University of Tennessee students and faculty that will be available for bidding. All proceeds from the art gala will benefit the efforts of Beardsley Farm and Alpha Rho Chi. The event is FREE to the public, and hors d'oeuvres from the Tootsie Truck, the Crown and Goose, and Tupelo Honey will be available for attendees to enjoy. Most of the produce in the hors d'oeuvres is sourced directly from CAC Beardsley Community Farm. Alpha Rho Chi is a professional fraternity for design students in programs such as architecture, interior architecture, and art where students explore professionalism and philanthropy. CAC Beardsley Community Farm is an urban community farm that promotes food security and sustainable agriculture. 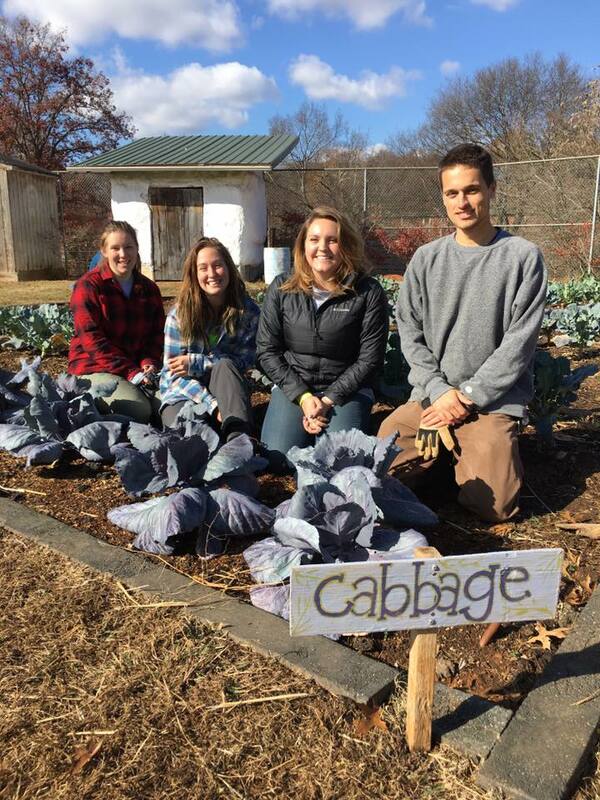 Since 1998, Beardsley Farm has worked to increase access to fresh produce in Knoxville’s food deserts through produce donations, educational programs, and community gardening. Beardsley Farm grows over 100 varieties of fruits and vegetables on about four-acres of productive land with the help of over 2,000 annual volunteers. Celebrate the start of cool weather with a class on nourishing soup preparation! Come to Beardsley Farm's Education Center directly following our October Community Workday to learn how to prepare a fall soup from scratch. Learn about stock and broth, try samples, and get a step by step tutorial on how to make a soup using Beardsley produce, fresh ground spices, and homemade stock. We'll send you home with a few recipes to try on your own. As always, these classes are free and open to the public. The class begins at 12:15 and goes until 1:30 pm. Join us for our October Community Workday! With fall in full swing, come out and join us for a little Saturday harvesting, weeding, planting, and fellowship! Bring your family, friends, and neighbors out for what is sure to be a beautiful day on the farm. Come early for Farm Yoga and stay late for our Fall Soup Seminar class! Join us for yoga on the farm on October 7th from 8:00am until 8:50am at Beardsley Community Farm. Our farm yoga class is a karma class and there is a suggested donation of $5 to benefit our non-profit. Instructor Rose Attea will be teaching a refreshing, basic yoga class, appropriate for all ability levels. Bring your own yoga mat and a water bottle. The class will be held outdoors under the Beardsley Farm outdoor classroom shelter. In case of rain, we will move it inside. After yoga, stick around for the October Community Workday and Fall Soup Seminar! Join the Old City’s best chefs and artisans for an unforgettable experience benefitting CAC Beardsley Community Farm. The Long Table Dinner will raise funds for the farm's operating budget to provide sustainable grown produce to those in need in Knoxville. The dinner features five courses of amazing food paired with craft beer and local wine. The event also includes live entertainment and a live auction, and takes place in a unique, open-air setting in the heart of the Old City. A portion of Central Avenue will be closed off for the festivities. This extraordinary collaboration includes local favorites Old City Wine Bar;The Crown and Goose; OliBea; Wild Love Bakehouse and Old City Java;Pretentious Beer Co, Pretentious Glass Co; and Molly Jo Events. Seating is limited for this very special event. Tickets are available for purchase here.